Designed for cleaning CCD, CMOS, and other delicate optical and imaging surfaces, this 12-pack of Type 2 Sensor Swabs from Photographic Solutions are specifically designed for image sensors measuring 17mm high, such as DX or APS-C sensors. Each of the swabs are individually packaged to ensure purity and feature a long handle for easier access to difficult-to-reach areas. The swabs are designed for one-time use in conjunction with the Eclipse Optic Cleaning Fluid to rid the image sensor of dust or other particles that affect image quality. Type 2-sized swabs measure 17mm wide and are well-suited for cameras featuring DX or APS-C image sensors, such as the Canon EOS 7D Mark II, 70D, Nikon D7100, and D5300, among others. For a complete camera to swab size compatibility listing, please click here. Box Dimensions (LxWxH) 5.5 x 4.0 x 0.75"
Sensor Swabs (Type 2, 12-Pack) is rated 4.5 out of 5 by 75. Rated 5 out of 5 by Doug from They Work Fine This is the system I chose for sensor cleaning because their website and marketing materials, as well as industry reviews, gave me confidence that I could clean my sensor with their products without damaging my camera.That has proven to be true. I buy the dry swabs and use their Eclipse cleaner. I did try their prewetted swabs, but I felt they were overmoistened so I changed to dry swabs and separate cleaning fluid.I would also add that if you have gone a prolonged time without cleaning the sensor, it may take more than 1 or 2 swabs to get to a clean sensor. Also, I use Delkin's Sensor Scope to observe my work. IMHO, it's essential to be able to visually check your work under high magnification. Rated 1 out of 5 by magisterludi from Worse than nothing I've been cleaning my sensors on 10 DSLRS for 7 years now, always using a carefully fitted rubber spatula wrapped with a Pec Pad and with 2 drops of Eclipse. Usually got perfect results with 1 to 3 applications. Recently I felt rich and tried out the Sensor Swabs, both the Type 2 for my D300 and the Type 3 for my D700. I went through an entire box of a dozen and my D300 is every bit as dirty as when I started. The fabric appears to release as much particulate fiber matter as it claims to remove, and the wrapping of the plastic spatula is sloppy, a far poorer and less precise tool than my trusty old custom-made rubbermaid-based instrument. Halfway through the box of Type 3 Swabs, my D700 looks worse than when I started, and I'm chucking the rest, writing off the loss, and getting me some more Pec Pads. If all you care about are particles the size of rocks they should work fine for you. Rated 4 out of 5 by Anonymous from Great sensor cleaners I've used these swabs with Eclipse solutions to clean my filthy camera sensors under rather extreme conditions: 1) after changing lenses during a tropical storm with 70+ mph winds and salt spray on the beach and 2) during a multiweek trip through the desert loaded with the finest and grittiest dust you can imagine. Guess what? Perfectly clean sensors. I am rating this as 4 stars only due to cost, functionally these are great. *Just a note, I've seen others discuss streaked sensors, this comes from using too much solution, one or two drops is recommended. Three or more=streaking! Follow the directions, folks! Rated 4 out of 5 by Dave H. from Gets the Job Done I'll start by saying that the first time I personally cleaned a sensor was using this product and the Eclipse solution on my D7100. I also purchased the Carson SM-44 magnifier (this, or something like it is a must!). I had never cleaned a sensor myself, so I was very hesitant to apply any kind of pressure to the swab. In the end, after 3 swabs, I found a happy medium between pressure and caution. The magnifier was very useful. Also, I would expect it to be a bit more difficult, but not impossible, to clean the sensor without any kind of solution. For under $, I would highly recommend using the Eclipse solution. Rated 4 out of 5 by Anonymous from The Only Effective Way to Clean a Sensor I've tried lots of dry solutions (blowers, brushes, etc.) and they all led to endless cleaning cycles, each one introducing new dirt/dust. These Sensor Swabs, along with Photographic Solutions' Eclipse Optic Lens Cleaning Solution got my sensor completely clean after two attempts.Dragging a wet cloth across my camera's sensor will never be a comfortable thing to do (I sweat just thinking about it), but ultimately it's the technique that gets the job done with the least amount of hassle. NOTE: Be sure you are ordering the correct Swab size for your camera's sensor. Rated 4 out of 5 by rccphoto from Good for DIY sensor cleaning Used with a sensor cleaning solution and carefully following a good set of instructions available in many places on the internet, these swabs produce a good result. I clean my own D300 as well as the 30D and T2i sensors in the cameras that are part of our college Photography loan program. A first pass in each direction is usually 90 percent effective, and a second pass usually picks up the final dirt and grease specks. Someone who cleans sensors professionally has the advantage of using a small vacuum, and working with excellent lighting and at least one magnifying device and sometimes two. But for the average user these swabs will be a cost-effective alternative between professional cleanings. Rated 5 out of 5 by Doug from Sensor Swab System Works I think I have a little extra insight about glass because I used to buy and inspect glass for a window manufacturer. In my opinion, after any glass surface has been exposed to air for a period of time it will develop a dirty film. That film may require more than one cleaning before it is gone. I recommend using a minimum amount of cleaning solution on the swab, but using as many clean swabs as necessary in order to get the sensor clean. I also use the Belkin illuminated sensor magnifier for inspection. I think it's essential to use magnification to examine your progress. Rated 5 out of 5 by Jabs from Worked like a charm! I had sporadic spots on my image sensor which I believe came from moving from an air-conditioned room to a humid climate outside. I tried using dust blowers, but they did not work. After doing some research, it appeared that the image sensor on my Nikon D300 needed cleaning. 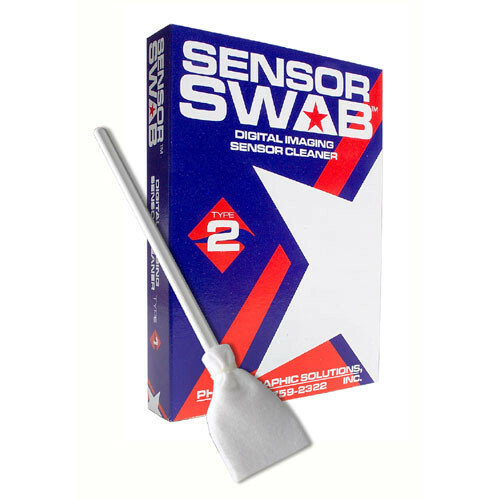 I got some assurances about doing it myself from some internet research, and found these sensor cleaning swabs at B&H. I wasn't sure I needed the fluid too, but I didn't purchase it. I cleaned the sensor using the swabs and did some test photos. It seems they worked fine so far. Would this size work for the 5D Mark ii? If not what size would? No. Swabs are individually packaged in plastic envelopes and cleaning solution is added at time of use. I don't think the bottled cleaning solution expires either- at least I've never had any issues with bottles I've owned for years. Is this the correct sensor swab for EOS 70D? Can I use this on a black magic pocket cinema camera?